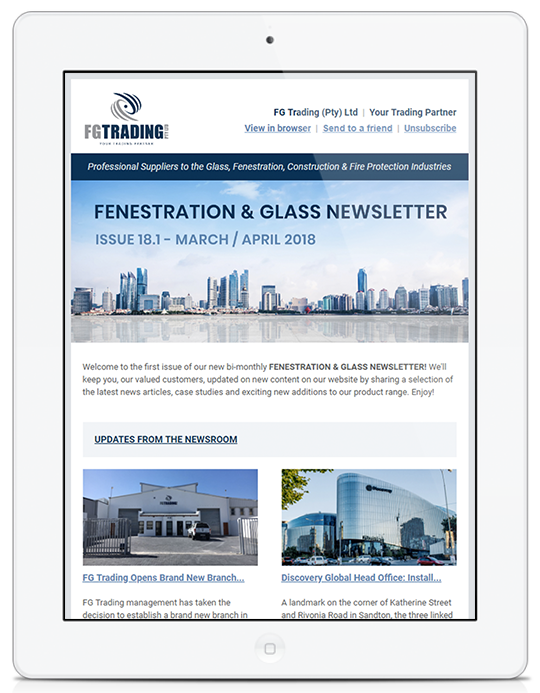 In line with growing demand and a steady increase in the number of glass and glazing factories and construction projects in Cape Town, FG Trading management has taken the decision to establish a brand new branch in the Mother City. We are pleased to announce that after its official opening on the 1st of February 2018 the new branch is now fully operational. In keeping with the Johannesburg and Durban branches, it will be carrying stock of the vast majority of our product lines including our double glazing components, sealing and bonding products and surface protection products. The branch is centrally located in Capricorn Business Park in Muizenberg, at Unit 1833 Capricorn Crescent, making it easily accessible to local manufacturers and processors. The new branch will facilitate better product and service delivery for Cape Town as well as the greater Western Cape area, by allowing us to attend to orders and enquiries faster and more efficiently. FG Trading also welcomes a new staff member to our team, Mr. Jaco Taljaard. Jaco is the Technical Sales Representative who will be looking after new and existing Cape Town customers and will also be the point of contact for all Cape Town orders and enquiries. He can be contacted on salesct@fgtrading.co.za or +27 21 741 0960.